IHI stands for Ishikawajima-Harima Heavy Industries. Based in Tokyo, Japan, the IHI Corporation was founded in 1853. The company produces heavy equipment and machinery for construction, mining, military, aircraft, space exploration, bridges, transportation, and industry. International company IHI Construction Machinery, Ltd. was created in 1952 under the IHI Corporation and US company Koehring. IHI Compact Excavator Sales, LLC distributes IHI products in North and South America. 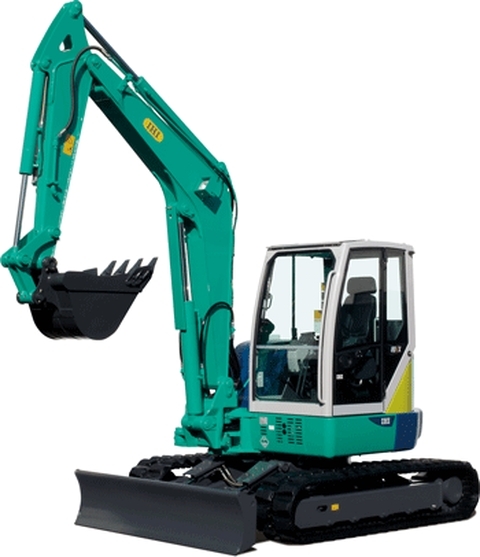 They sell twelve different mini excavators, including conventional and zero tail swing models. IHI compact excavators range in weight from 2,060 pounds to 18,100 pounds. Digging depths on these mini excavators go from 5 feet 2 inches to 15 feet 1 inch. These machines run with horsepower from 10 to 58.7. One of the most unique and smallest of this series is the 9VX Electric mini excavator. The 9VX Electric weighs 2,100 pounds and runs on electricity. There are no fumes, and the 5 horsepower Baldor engine runs with very low noise levels. It can travel at two speeds, comes with a 75 foot power cord, and can turn 360 degrees. The bucket has a digging depth of 5 feet and 2 inches. Standard expandable tracks retract to fit through tight passageways and expand to provide added stability. 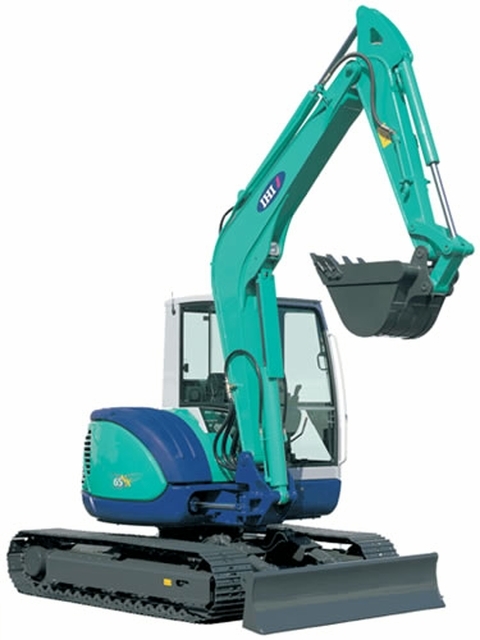 The largest IHI compact excavators are model number 80VX. This large mini has 900 pounds of counterweight added to make it a zero tail swing machine. A wide cabin provides tons of operator space, and full side panel windows provide ultimate visibility. The machine comes with a standard 20 inch high dozer backfill blade. The 80VX’s Yanmar 4TNV98 engine is environmentally friendly while providing plenty of power. Consumers can choose between rubber and steel tracks. Variable displacement pumps, auxiliary hydraulics, and hydraulic pilot controls are all standard. Optional attachments include: Auger, Hammer, Thumb, Special Buckets, Compactor, Quick Coupler, Hand Held Tools, Cemetery Bucket, Concrete Crusher, and Rip-N-Pin. 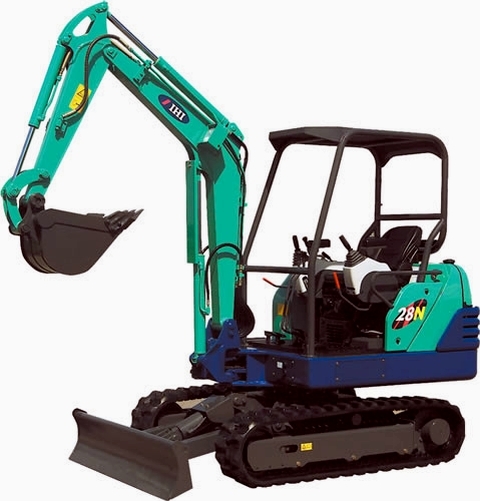 The 35N-3 is one of the mid-sized IHI compact excavators. It is a traditional style mini with some of the best operator comfort options in its class. The cabin is very large and the chair is a one-piece suspension seat with armrest. The controls are short lever hydraulic pilot joystick controls that increase responsiveness. Standard large traction pedals make foot controls easier to maneuver. Auxiliary hydraulics and variable displacement piston pumps come standard. Maintenance is simple and convenient with full opening covers. With a standard backfill blade and bucket force of 7,662 pounds, the mid-size mini can do a lot of big jobs. They look like excellent pieces of equipment. I wonder how they will compare to other japanese makes such as Kubota and Komatsu? I own office condos by Florida Mall in Orlando Florida, that I am interested to trade or barter for haeavy construction Equipment. If anyone is interested , please contact me in the email listed above.